Brunch is probably one of the best inventions in the land of meals, everyone loves brunch, people love to say brunch and they love to eat brunch and I am one of those people. I love brunch and I can honestly say that brunch loves me. I had the most overwhelming craving for hash brown potatoes this morning. The thought of the crunchy yet creamy texture of these luscious spuds was all consuming. I knew my guests would be as happy to have this as I was to prepare it so while everyone was still snoozing I set to work on making a simple brunch of poached eggs and potato. Poached eggs are so dramatic. Poached eggs demand attention. Poached eggs are spoiled little brats. 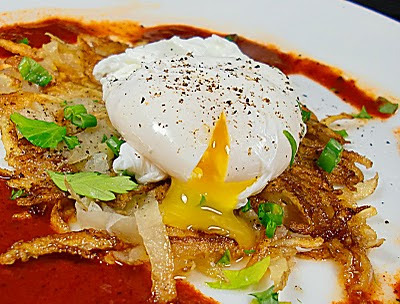 Red chile is one of the best flavors to pair up with eggs and taters. New Mexico red chile is like eating sunshine and who wouldnt want a little sunshine on the first day of the year. Those poached eggs of yours are absolutely gorgeous! you make the perfect poached eggs... Happy New Year Christo! Cheers to more posts and food adventures! I pretty much love ANYTHING potato. YUMMY! 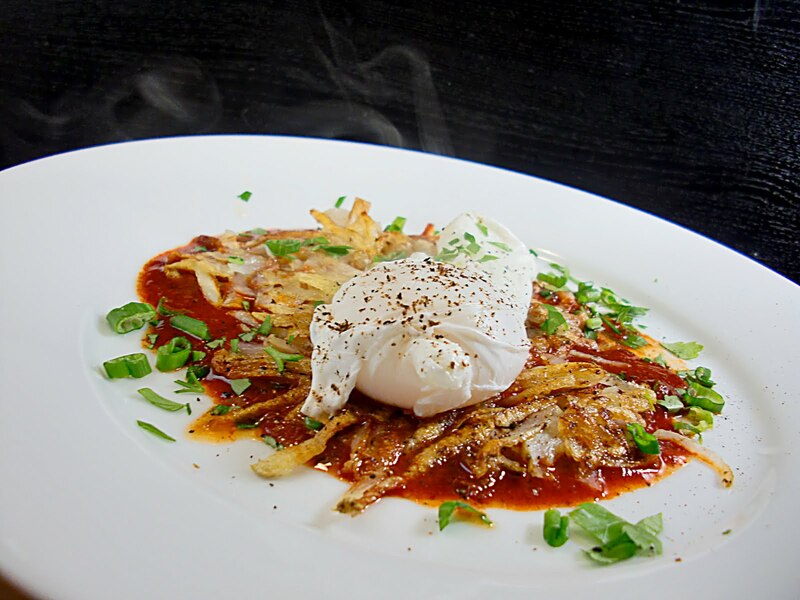 I've never been a fan of poached eggs or red chili sauce but, these pictures you've posted make me want to try again :-) I'm envious of those at your place who got to eat this delicious dish this morning! I'm a big brunch fan myself and crispy, perfectly cooked hash browns can't be beat. You're so right - poached eggs can be little brats, but never for you - your's are always perfect. I cheat with a little egg poacher pan from WS. I love brunch ~ Heck I just love food and this looks yummy! You took good care of your guests, I can see, and you took good care of the spoilt brats(eggs) too! I'm really pissed that I'm out of potatoes, now. This combination must be had! Great job poaching the egg! It looks like it came out with just the right amount of runiness in the center. I purposely avoid cooking eggs because I can never get it. Beautiful! Love the addn of the red beneath the hash browns. Now THAT'S what I'd call brunch! Who eats brunch without chili doesn't know brunch. Another brunch lover here. Your poached egg looks absolutely wonderful. Your potatoes have to be able to stand up to that delicious egg! Thanks for sharing and inspiring me to add new items to my brunches. It looks great and I think the red chili makes it! haha, poached eggs are spoiled brats, but from the look of it, well worth it too! That is a good looking egg. And I agree with you brunch is something to enjoy. Looks beautiful. I've got a potato and some red chile sauce in the fridge. I know what I'm making. Happy New Year to you! Poached eggs ARE spoiled little brats! I love it!! Making and eating poached eggs is so much fun :) This looks like a great brunch dish and I'm sure your guests loved it! I totally prefer savory over sweet when it comes to brunch. I've recently picked up the trick of squeezing the grated raw potato in a potato ricer - just brilliant to remove the excess water - for hash browns and potato rosti. And for grated zucchini in the right season. 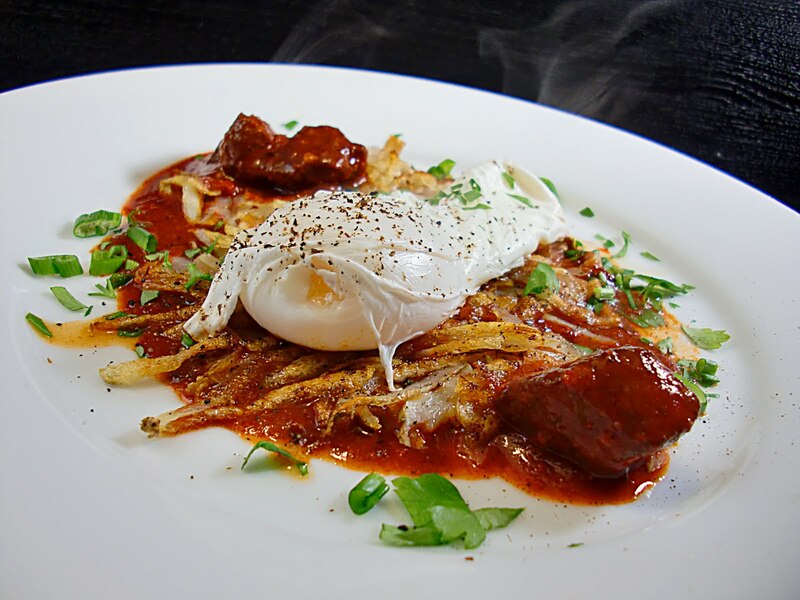 Your poached eggs look perfect, I'm happily imagining all the flavours and textures of this brunch dish - mmmmmmmm. Monsieur Huevos strikes again! This time with my all time fave combo, potatoes~And of course the added heat of the red sauce! I love poached eggs, so elegant and not intimidating to make if you know the tricks. Which you obviously do! YUM. Happy New Year, Cristo! 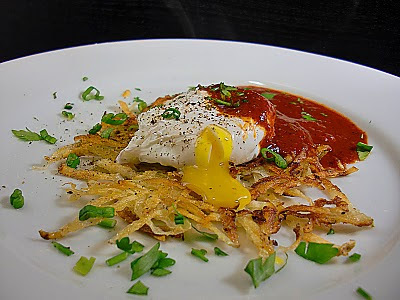 I love hash browns, but I've never mastered the poached egg. Truth be told, I haven't tried too hard, either. 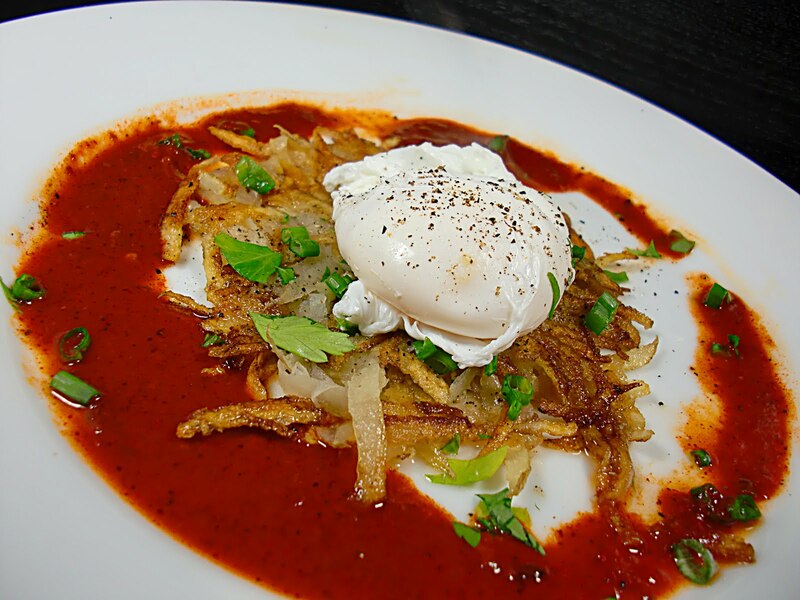 I'll skip the red chile sauce, but I'd love some Hollandaise! Brunch = the win! It is such a fun meal. Beautiful dish....the chili just pops it right over the top. Your poached eggs looks picture perfect! I do love a good brunch! Happy New Year! Poached eggs totally demand attention in this house...doesn't get much better...or more dramatic, you're right! Looks like my kinda brunch. Spectacular looking -- you do eggs really well and I love all those crunchies. I loved your comment "Poached eggs are brats." Indeed they are, but you managed to tame them beautifully. Spoiled little brats! Hilarious. I tend to think of them as a little "needy," but worth it. Just my kind of brunch...or lunch...or dinner for that matter. Maybe even a late night snack! That poached egg is a spoiled brat alright!